When we are wearing our diamond jewelry we don’t often think about the way the diamonds came to be where they are. A natural diamond is taken from the earth through a process called mining. There are two ways of performing this process. One of the ways is called Alluvial Mining and the other is called Pipe Mining. Volcanic pipes are used to pull the diamonds from the ground when the process used in pipe mining. Man did not create these pipes. These pipes are formed naturally in the earth. Next to the pipes shanks are placed while tunnels are drilled through the pipe. The large rocks that are pulled from the mine are taken to sorting areas to be screened for diamonds. When the Alluvial process is used the mining process is done on the riverbeds and beaches. The sand that is on the beach will be moved until the right level for finding diamonds is achieved. A barrier is made to keep the water away while the mining is being performed. The same process of removing the piles of sand is made as the rocks are removed in the pipe method. The sand is brought to a screening area where the sand will be searched for diamonds. Where are the diamond mines? In the north east region of western Australia is the Argye mine. Rio Tinto owns this mine. This particular mine is the biggest single producer mine in the world. It does not, however, contain the very valuable diamonds so its value is not the highest in the world. Ninety to ninety five percent of all the pink diamonds in the world come from this mine. Rio Tinto also owns the Diavik mine, which is located in Canada. It is on an island that is south of the Arctic Circle and north of Yellowknife. This mind has seven hundred employees and finds over eight million carats a year. BHP Billiton owns the Ekati mine that is south of the Arctic Circle, also in Canada. The diamonds that are found here are sold using the name Aurias as their trade name. The authenticity of the diamonds is checked by the Canadamark service. BHP Billiton Diamonds also owns this. In the Orange River, which is in South Africa, Trans Hex runs mine the Baken diamond. They produced stones with an average size of 1.29 carats. A stone was found at this mine that weighed 78.9 carats and was purchased for 1.8 million dollars. There was also a 27.67 carat pink diamond found at this mine and it sold for over one million dollars. The second mine in Australia is the Merlin mine. It is not operational any longer, but Rio Tinto also owned this mine. It was sold to Striker Resources who had considered opening the mine back up. The worlds largest mine is the Orapa mine. This mine is west of Francistown. It is owned by a partnership between the Botswana government and DeBeers, which is called Debswana. This partnership is responsible for the education of the children of employees of the mine. It operates a hospital and a game park as well. It started in 1971 and is the longest running mine that the Debswana partnership owns. Debeers also owns the Premier mine which is in South Africa. In 1905 a 3106.75-carat diamond was pulled from this mine. This diamond was named the Cullinan Diamond. The Golden Jubilee diamond also came from this mine and weighed 545.67 carats. 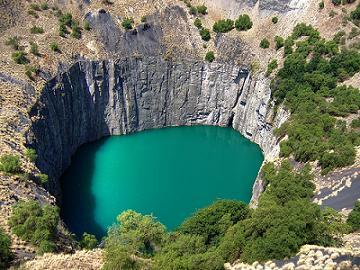 The mine has since changed its name to the Cullinan Diamond Mine.